“Bernhardt/Hamlet” She’s great. The play is not. A theater goddess walks among us. Clearly, British actress Janet McTeer is one of the greats. Anyone who saw her “Doll’s House” back in the day can attest to this. Anyone who sees Theresa Rebeck’s half-baked “Bernhardt/Hamlet” will wonder why this acting colossus is attempting this pygmy play. And of course, the answer is “There are no great parts for women.” Or few great parts as the play makes abundantly clear. Over and over and over again. Pedantic, didactic and I agree with playwright Rebeck’s conclusion. And frustration. But the means she uses to execute her thesis, and this is a thesis play. Collegiate. If she were in college, and she wrote this at the time she was in college, say roughly the 1970s, it may have seemed like something sparkling and new, but as “Bernhardt/Hamlet” as presented on Broadway by the redoubtable Roundabout, it is trite, trite, trite. However the sublime Janet McTeer makes you almost forget all these things. Almost. If Hamlet was a vivacious housewife who just solved her servant problem. And she is surrounded by some of the best young actors working today. Dylan Baker, Matt Saldivar, Nick Westrate and main among them, Jason Butler Harner. And they are all defeated by this mediocre material that the Roundabout is trying to foist on us as a silk purse, when it’s really the sow’s ear. Or in this case, the entire sow. McTeer is a gargantuan presence. She is six-foot five at least, with the deepest and most resonant of voices. She has played many, many male roles herself, recently a remarkable Petruchio, in the Public Theater’s Shakespeare in the Park’s all female “Shrew” a few seasons back. And on-screen she was the transvestite lover of Glenn Close in “Albert Nobbs.” So she is no stranger to cross-dressing. 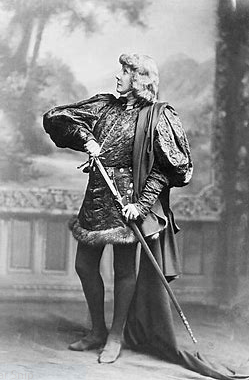 Nor, evidently, was the diminutive Bernhardt, who was barely five feet. Considered to this day, the greatest actress of the 19th century, she was a dyed-in-the-wool eccentric. She slept in a coffin. She had a leopard for a pet, and wore a hat made out of bats’ wings. The only way we non-time-traveling mortals can experience her greatness today is by reading about her in the many, many books and biographies of “La Divina” as she was known. And the contemporary reviews of her critics. Don’t forget the critics! George Bernard Shaw and Oscar Wilde both adored her and wanted her in their plays. None of this is in “Bernhardt/Hamlet.” Rebeck the writer makes her seem smaller than life and seems to have tailored this play as simply as a vehicle for the dynamic McTeer. 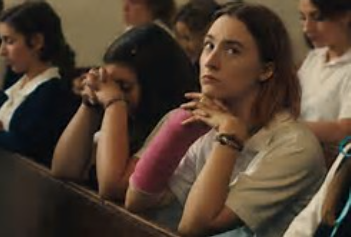 Who deserves to have plays written for her. Just not this one. She seems like a socialite, a gad-fly, someone who likes to have a beer and pal around with the guys, rather than sleep with them. 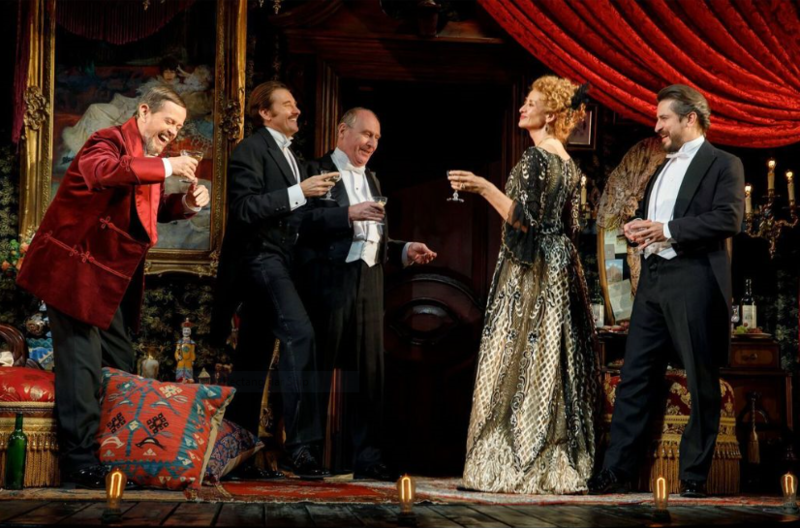 She had many, many lovers and yes, McTeer kisses Butler Harner (As Edmund Rostand) again and again and again. As if to prove some kind of heterosexual point. The great French playwright wrote “Cyrano de Bergerac” for her, but the part of Roxanne is hardly what you remember Cyrano for. And she chastises him, but he doesn’t make the part any better, and she still continues her affair with him. And yes, they kiss and they kiss and they kiss at every opportunity. Rebeck even presents us with Rostand’s wife,(Ito Aghayere) who in a very bizarre scene, seems to condone the affair, but that’s about as eccentric as this earth-bound Berhhardt is allowed to get. Rebeck has made the great Bernhardt seem very everyday as an actress. She seems remarkably superficial, constantly complaining the Shakespeare’s greatest play had too many words in it. And constantly going “up” (forgetting her lines) in rehearsals, which this Bernhardt seems to treat as a schlog and a joke. Ah! But then McTeer is allowed to do “Hamlet” straight on, it is just wonderful. And a great gift to those who witness it. 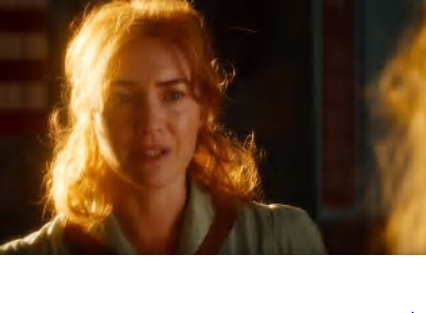 There are only TWO niggardly moments that Rebeck allows her to play Hamlet at full throttle..
At the beginning of Act Two, she gets to do the entire “What a piece of work is man” scene with Rosencrantz and Guildenstern. 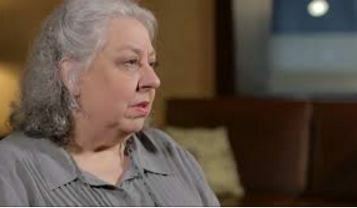 And she and Dylan Baker play the Ghost scene as if it were a love scene and it works. (pictured above^)How it works! These two moments really are worth the price of admission. 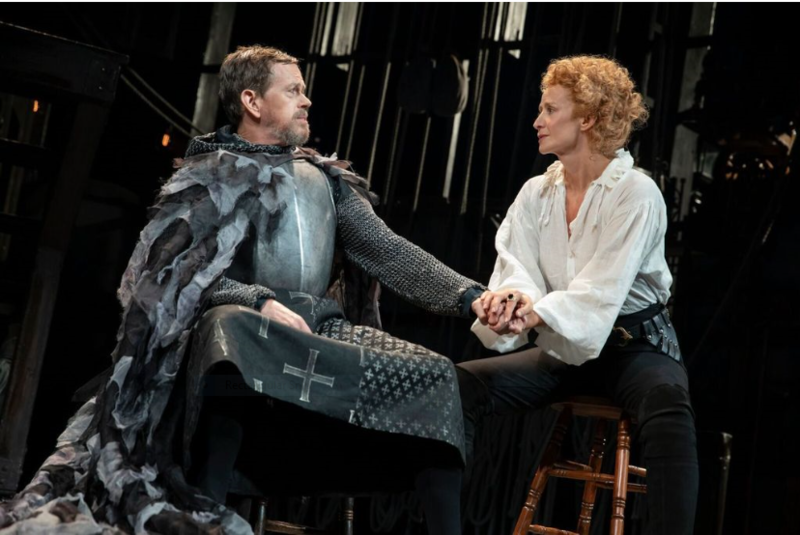 I just which we had a chance to see the great Janet McTeer do ALL of the real Hamlet and not just this shoddy imitation. And would that the witty and wonderful late playwright Wendy Wasserstein was still with us. SHE would’ve made Bernhardt scintillating, rather the mundane feminist Rebeck leaves us with. 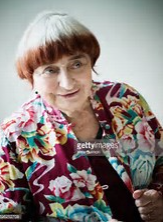 Agnes Varda, 89, Is Up, in More Ways than One @ the NYFF! 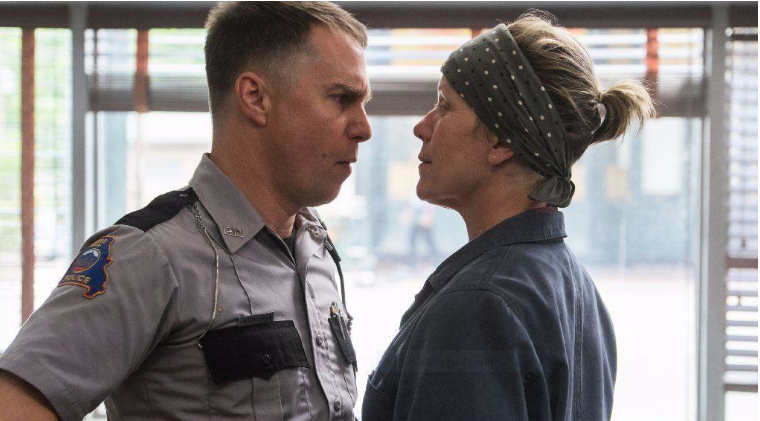 Everything is so up at the NYFF 55, it makes my heart sing! Not the least of which is their big tribute to the tiniest of French Grande Dames du Cinema, Agnes Varda. My latest review at Awardsdaily.com on the great French icon. I called it “Hot at 89” And it was published within minutes! Beautiful lay-out by Sasha Stone and her gifted editor Ryan Adams! Merci a tous, as Agnes would say. “Dunkirk” Lives Up to It’s Oscar Hype! Mark Rylance Will Get His 2nd Oscar nom! I just LOVED “Dunkirk”! Not a fan of war movies as a rule, the cinemaster Christopher Nolan has re-written the book on this genre as well as re-inventing it with this spectacular achievement . 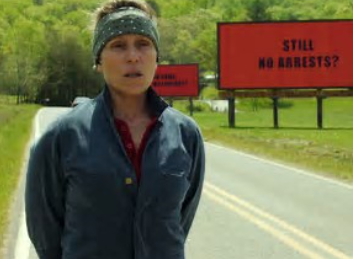 It’s a heart-pounding, edge-of-your-seat, white knuckle thriller as well as an eye-popping, frightening and ultimately triumphant Best Picture of the Year. Well, so far, anyway. It’s hard to imagine anything that will top it in terms of its’ size and scope, and story, too. Christopher Nolan is the screen-writer as well as director, and also, a producer. 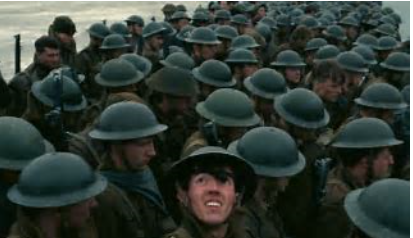 I found myself moved from the first frames of “Dunkirk,” with its’ magnificent Hans Zimmer score thumping and pounding and shaking the earth, which in the first shots are a picturesque rendering of the French seaside town of Dunkirk as it was then, in June of 1940 . Nazi leaflets are dropping like autumn leaves on the young British soldiers below, who all are about to be slaughtered outright by the unseen enemies machine gun bullets. 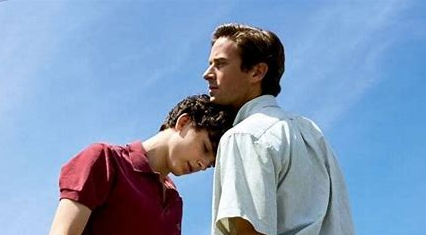 The most unlikely, scrawny, leading young man is newcomer Fionn Whitehead, (See above and at top of page) who we are going to follow through his epic journey of struggling to survive the evacuation of 400,000 British and allied troops, who are stranded on the beaches of Dunkirk. Bullets are ripping, searing and whizzing everywhere as Nazi planes pound the helpless soldiers, exposed, vulnerable and innumerable on the Dunkirk beach. They are just sitting ducks. “It’s like shooting fish in a barrel” one officer proclaims. How will they EVER get out of there? And that is the drama that director Nolan is portraying so incredibly accurately, and in such a breath-taking and wholly cinematic detail. Nolan’s exacting directorial eye gives verisimilitude a new meaning. Oscar winner Mark Rylance (for Best Supporting Actor for “Bridge of Spies”) is the truly heroic, mild-mannered, stiff-upper-lipped British captain. owner of his own medium-sized, pleasure yacht, hardly a warship. It is one of the many civilian small craft that are commandeered by Churchill to set sail across the churning English Channel and rescue all those stranded soldiers. Rylance’s no-nonsense, utterly focused, amateur seaman/citizen is a masterpiece of restraint, understatement and terse John Bull heroism. And he’s symbolic of one of hundreds of small boats that turned the tide of this terrible war, WWII. They did the impossible, because they had to. How they were called upon and how all they just stepped up to this incredible, daunting challenge and how in doing so served their country and saved the free world. Churchill’s thrilling call to arms “We will fight on the beaches!” echoes throughout the film, and as a first generation Brit myself, I was immensely proud of all of them. magnificently depicted here in this their finest John Bull hour of courage. It’s a David v. Goliath feat, and it’s all true. This really did happen. And Nolan re-creates it down to the smallest, scarifying detail. 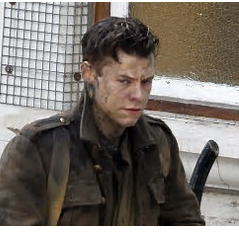 Not even pop star Harry Styles, who acquits himself quite admirably as the gnarliest of the small group of British soldiers, teenagers, really, can fall out of line. If you weren’t looking for him, he would blend in totally with the other young, struggling, dirty, frightened, brave soldiers. 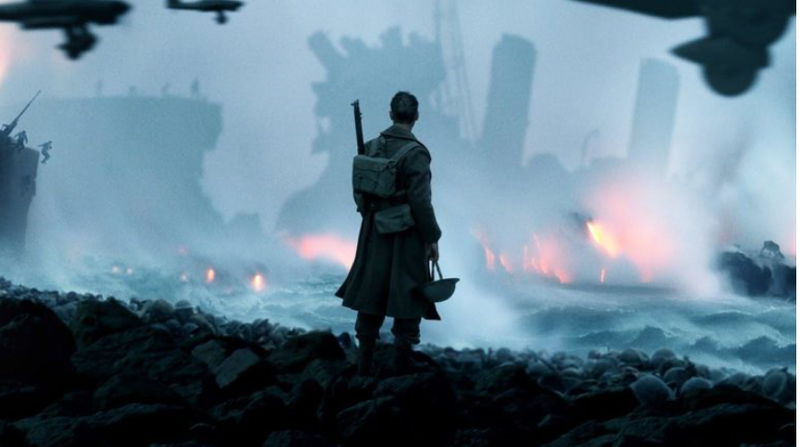 “Dunkirk” explodes with many, many understated and marvelously compelling performances. 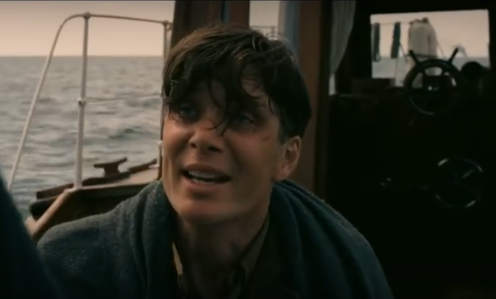 Irish actor Cillian Murphy(below)is totally unrecognizable as a survivor of a downed plane that Rylance and his crew of two lads rescue from the sea. Is he a German? Is he a deserter? Rylance’s scenes of struggle between him and Murphy will. I’m pretty sure, net the Oscar winner another nomination. He’s got the biggest part. The Academy likes to nominate those they’ve awarded and nominated before. 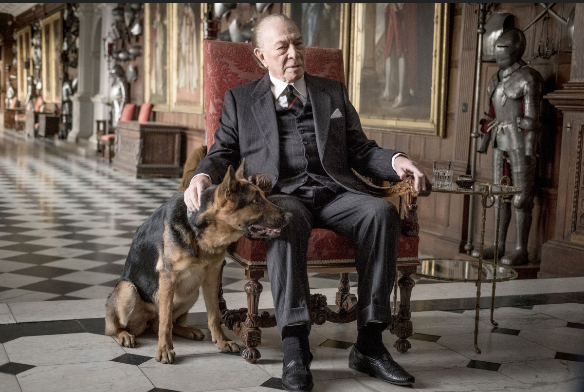 But Murphy, Whitehead, Styles and Sir Kenneth Branagh (as the British troop leader,who has the most moving single line in the film, which I won’t reveal here) are all exemplary. 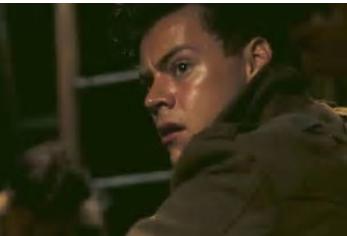 That Harry Styles in his film debut holds his own with these Knights of the Realm is as much a tribute to Nolan’s laconic, terse direction of the actors as well as the many, many ships at sea and the planes in the air. And to shoot this all on water! How did he get those incredible, aquatic shots? Hoyte Van Hoytena, the superb cinematographer of the awe-inspiring, acrobatic camera work is surely on his way to an Oscar for his astounding work here of filming the unfilmable on land and on sea .There’s not a lot of blood in “Dunkirk” but there is an awful lot of water! Lee Smith’s phenomenal, fast-paced film editing is going to be acknowledged, too, at awards-time, I’m so sure. 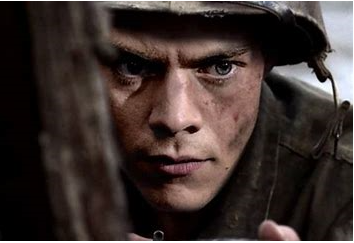 “Dunkirk” is incredibly only 90 minutes! And it’s shot on film. Nothing is digital. A special note most also be taken of previous Oscar nominee Tom Hardy (for Best Supporting Actor for “The Revenant”)’s ability to act throughout the film almost entirely in a pilot’s gas mask, with only his eyes and his voice for expression. (See above) He’s got to carry nearly a third of the film in tight close-up in his fighter pilot’s cockpit. He’s as moving and as effective of those fighting to survive below, who we see in full. This picture was made for Oscar, and it will get nominated all over the place, and deservedly so. It’s a great movie. And a great movie movie. And Number One at the box-office for the past two weeks to boot. Don’t miss “Dunkirk”! 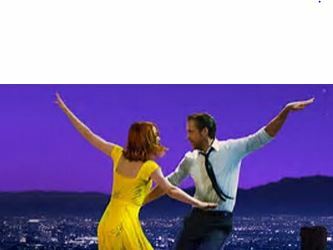 “La La Land” Sweeps Oscar Off His Feet. Emma Stone Will Win Best Actress! 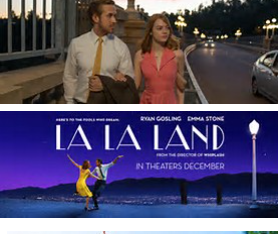 I must say, I resisted “La La Land” for the longest time imaginable. I, a musical comedy queen par excellence, just did not believe the hype, that this small scale musical(seems like there’s only two people in it) couldn’t with one fell swoop bring Musicals back to the movies? And go on to win Every Single Critics Best Picture Award in the book? And have a real shot at winning the Best Picture Oscar, too? And a singing and dancing Emma Stone was going to waltz her way to the Dobly Pavillion and dance off with her own Best Actress Oscar, too? Well, that’s exactly what happened. To this film with the ridiculous title. It’s winning everything. And I finally saw it and I fell in love with it. 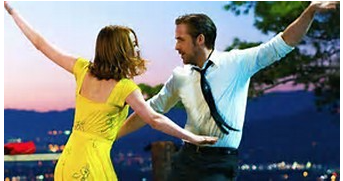 Starring two of the most beautiful people in the world, the aforementioned Emma Stone and the dazzlingly handsome Ryan Gosling, they not only sing their way into your heart, they dance there, too! And Ryan Gosling turns out to be an ace jazz piano player, and plays all the film’s musical numbers himself. Yes! With his own real hands! 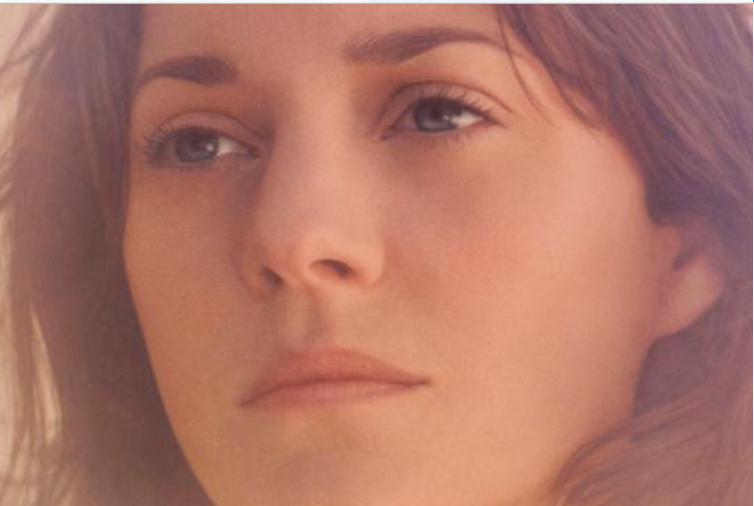 Brilliant 32- year- old director, a Hollywood wunderkind, if ever there was one. Damien Chazelle might be dancing with more than one Oscar in his hands come Awards Night. Which, for all its’ dramatics, was really a musical too. About Jazz, again. And both films are going to go down in Hollywood history as will Stone, Gosling, and Mandy Moore the brilliant choreographer. And yes, there is a third part in this film, too, J.T. Simmons, the sadist drum-teacher of “Whiplash,” which won him an Oscar last year. Here he’s a uber-nasty manager of the nightclub of sorts that our Hero Sebastian, (Gosling) has been reduced to playing Christmas ditties in. 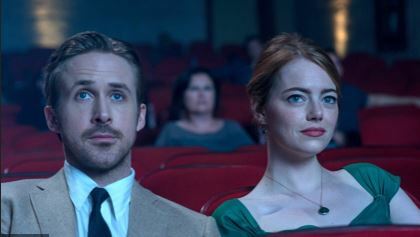 “La La Land” is the perfect film. For this year. It’s total escapism, and that’s what we all need right now. 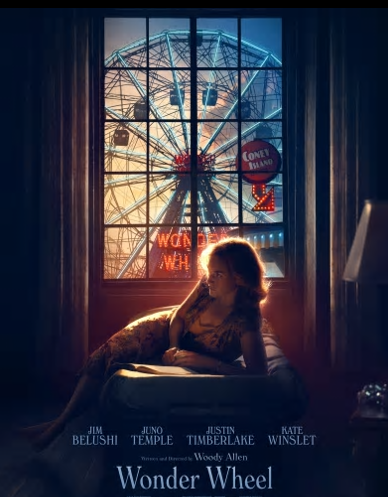 It just seems impossibly wonderful and harks back to all the great Movie Musicals of the 1930 through ’50s. 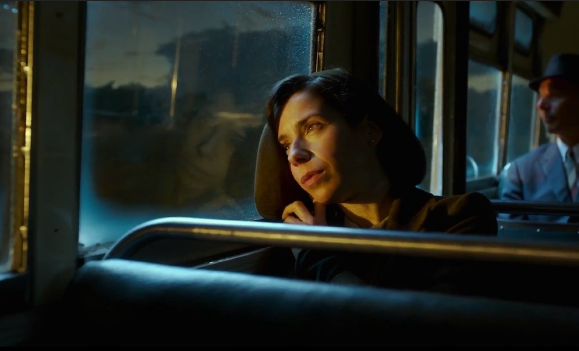 Being a song and dance man myself (I’ve also written MANY musicals myself, way back when, and an opera, too), I know what Seb (as she calls Gosling) and Mia(Stone) are going through. And it’s total rejection almost all the time. That’s Show Biz. And that’s particularly LA, where I lived for one year, and wondered how the dreams were manufactured that got me there. 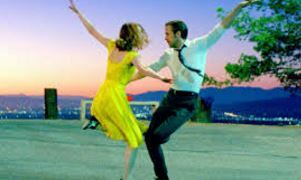 “La La Land” is a love poem to LA. And I have never seen it look so gorgeous. 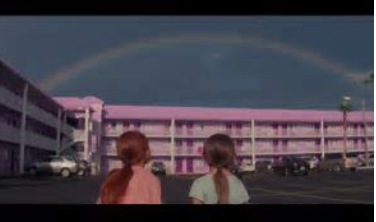 The cinematography is candy coated and Ms. Stone wears bold, single colored costumes. After a particularly brutal audition experience, she walks sadly down pinkish Hollywood streets in a royal blue dress. She later wears a solid yellow. Redheads are NEVER supposed to wear yellow, but Stone does, and she’s forever going to be associated with the “little yellow dress” that she’s seen dancing with Gosling as he falls in love with her. 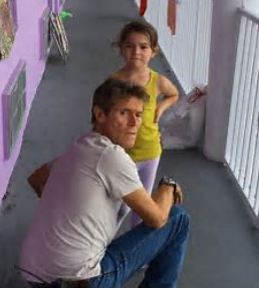 Oh yes, Stone is playing the ultimate Aspiring LA Actress. She’s so frustrated, she starts writing her own play, a one woman show for herself. I can related. I’ve done that, too. And she doubles her despair by becoming a playwright/actress. And she doesn’t understand or “get” jazz. So. of course, she’s at cross-purposes with Seb, because he’s the ultimate jazz aficionado, who wants to own his own jazz club some day. She wants to be a star. And somehow, through the magic of movies, they find each other and fall predictably in love, but not toooo predictably. “La La Land” starts with a massive traffic jam on a highway(some things never change. I hate cars. I hate smog. And I hated LA until I saw this lovely picture.) The entire stalled group of honking horns and frustrated drivers then inexplicably burst into song and dance. “Another Day of Sun,” which I found a bit much. Seb and Mia don’t sing and dance here. He honks his horn at her. She gives him the finger, and drives off. This I could relate to. But “La La Land” is a slow burn. It’s takes it’s time getting to where it wants to go, but boy, oh boy, when it gets there, it just KILLS you. I just couldn’t stop the tears. And in this last part of the movie, Emma Stone goes from being just Emma Stone, who we’ve now seen for years, the almost garden variety movie ingenue doing almost the same raspy-voiced, big-eyed schtick, suddenly transforms into the great Screen Goddess we all hoped she would be, and she turns into an actress of such unexpected depth and poignancy, as well as beauty, that glows like uranium, or more accurately Oscar gold. She’s Hollywood’s new Princess. The envelope, please. E.T.A. 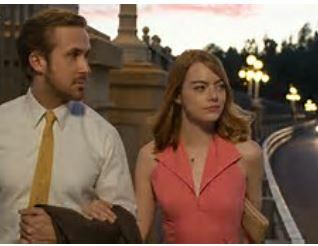 “La La Land” just led the pack with SEVEN Golden Globe nominations! More on this later. Will Drama Desk Winners Repeat at the TONYs? Will Drama Desk Winners repeat their triumphs at the TONYS? Probably. This year, especially. I think so. Above are pictured the two Best Actress winners. 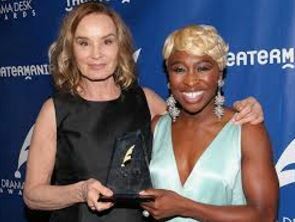 Jessica Lange for “Long Day’s Journey Into Night” and British newcomer Cynthia Erivo who is starring in “The Color People.” Lange won for Best Actress in a play and Erivo won for Best Actress in a Musical. I think these two ladies are Won and Done. At the Tonys. I think all four of these powerhouse thespians can rest assured the Tony Voters will like them, really like them,too. The Tony Voters do look increasingly to the Drama Desk winners to narrow their playing field, as it were. This year, though, the theatrical phenom “Hamilton” is nominated for more TONYs than any other production in Broadway history. But in these four leading categories I don’t think it will register as it is likely to do in others. “Hamilton” won nearly every award in the book LAST year when it was eligible for the Drama Desks(and also the Outer Critics Circle and the Obies) because it played Off Broadway first at its’ historic run at the Public that launched it to Broadway. In other news, I think juggernaut “Hamilton” may find itself stopped at the TONYS. Although it was nominated for a historic 16 awards, I think it’s going to register much, much less than that. 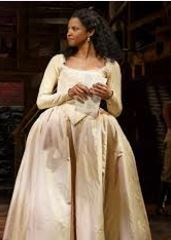 The only acting award I think is a surefire win for “Hamilton” is the charming young African-American actress Renee Elise Goldsberry, who won the Drama Desk last year for Best Featured(or Supporting) Actress in a Musical. And on the Drama side, the powerful performance of veteran Jayne Howdeyshell from the Best Play Drama Desk winner “The Humans” could score in Supporting, which is where the TONYS put her and co-star Reed Birney, although they are both leads. “The Humans” also won for Best Ensemble at the Drama Desks, a special category that the DDs always give, but the TONYs do not. “Hamilton” will win Best Musical for sure. But the TONY voters are notorious for spreading the wealth around, and I think they will do that this year, too, in spite of “Hamilton” perceived dominance. 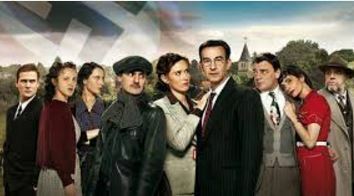 Much as I admire its’ audacity and ambitious reach of subject, the entire history of World War II, as encaptured in the life of a “French Village,” I hate to say it but this hit European TV series is very hit and miss. It sounds good on paper. Each season of the TV series will focus on a different year in the occupation of France by the Germans during WWII. And it starts off with a bang, as a group of school children go out to play on a field trip on a sun-dappled day in the tiny town of Villeneuve, a fictional subprefecture in the Jura region of France. German planes suddenly are seen over head and begin shooting up everything in sight, including the children. A horrifying beginning, to be sure. But then we are slowly introduced to the characters and I have to say I had no great feelings for any of them. Sure, the SITUATION they are is in riveting, but only up to a point. And the actors all look so similar it’s very hard to keep them and their plot-lines straight. 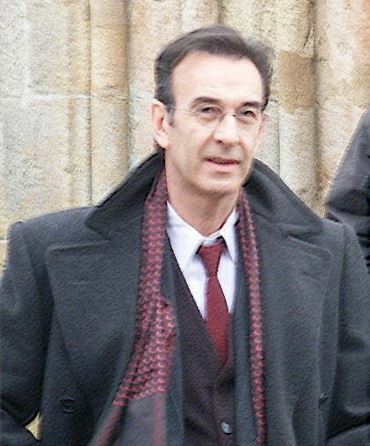 The exception is Robin Renucci, a doctor who is co-erced into becoming the town’s reluctant Mayor. And he is forced to do many things that he does not want to do within the course of the 10 episode series. Each episode a little under the hour in length. He is actually by his acceptance of the Mayoral position, an unwitting symbol of the Vichy government. His bourgeois family continues to live well as all around him begin to starve due to ration restrictions. The actors all being dark-haired and dark-eyed and average-looking, it took me a long time to sort out their different characters and predicaments. However, the incredible attention to war-time detail does fascinate. Some one can be jailed for just booing Hitler in a newsreel in a movie theater, for instance. Then there’s the leftists who want to insert resistance pamphlets in all the daily newspapers. And do. But the characters doing this are all sadly two dimensional. The Jewish question, and there a lot of Jews in this small town, is pretty much a non-issue until the latter part of Season One. Our understanding of WWII is so much based on the plight of the Jews that that part of the series suddenly springs to life as the Season ends. It’s a great record of the period, though and I particularly loved the Special Features wherein the actual townspeople these characters are often based on get to speak, in French, of their own real-life stories and they are all hair-raising. Being set so far out in the country the full impact of the War hits them only gradually, in stages. And it is truly harrowing, as one by one their liberties and freedoms and businesses and lives are all taken over by the occupying Germans. I am looking forward to Season Two. Maybe this time they’ll have more relatable characters.